How to get published? 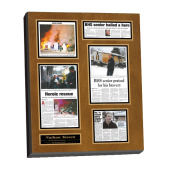 Get articles published and into custom frames. You don't have to be Ernest Hemmingway to get articles published. There is a simple way if followed you can begin to see your work in print. Whether in be in the local newspaper or a prominent magazine or you catch the eye of a book publisher and you ink your first book deal. How do you get published? Let's take a look. All articles have the same basic elements. Title, introduction, body, closing. First your article has to be easy to understand like you are talking to a friend. Be informal try to have a conversation with your readers. When you start out began to write about subjects you have a knowledge of. This will help build confidence writing on subjects you are familiar with. Try to keep the length of your articles between 300 and 500 words. Spend a lot of time on the Title. Here is a rule of thumb 50% of your time should be spent on the title of your article and 50% spent on the body. Yes the title is as important as what you write. A good title attracts some readers a great title stands out and gets you noticed. People normally scan through the article titles to decide which one interests them. If your title is not interesting or does not stand out no one will read it. This is true for submitting articles to publishers via email or posting online articles such as blogs. A good introduction let's us know why you are writing the article. Then the body should have a few paragraphs each topic covered should be a separated by a new paragraph. If you have specific points you can always use numbers or bullet points. Finish your article with a sound conclusion remaking your points and wrap up the article. Next use spell check before you submit and have someone else proofread spell check does not catch all errors. Now you have your content what next? Take it to the next level and be proactive getting your articles in the right place in front of the right people. First make a list of the publications you’d like to be in. If you don’t know what's local to your area, you can either go to the public library and ask the librarian for help or better yet, go online and Google the following:“city state periodalicals, or city state publications” “city state newspaper”. Of course, in place of city and state you put in your city and your state. Take initiative after you email follow up with a phone call, you'll probably get voice mail but just leave a well thought out voice mail to the effect that when they recieve your letter, "You'd be happy to answer any questions they may have about the content. Make it a point to continue with a series of emails and telephone calls until you are heard.